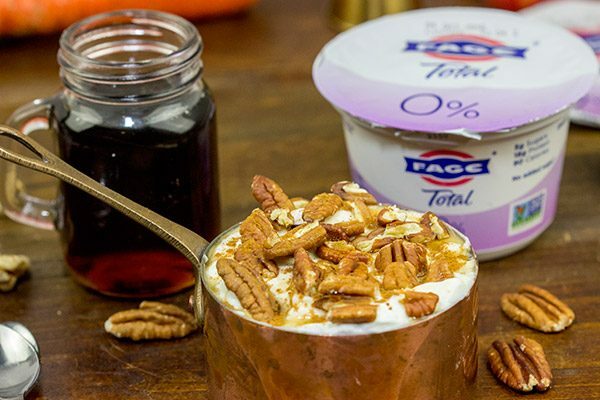 This Greek Yogurt with Nuts, Honey and Maple Syrup post is sponsored by Everywhere Agency on behalf of FAGE; however, all thoughts and opinions expressed are my own. How do you top your yogurt? 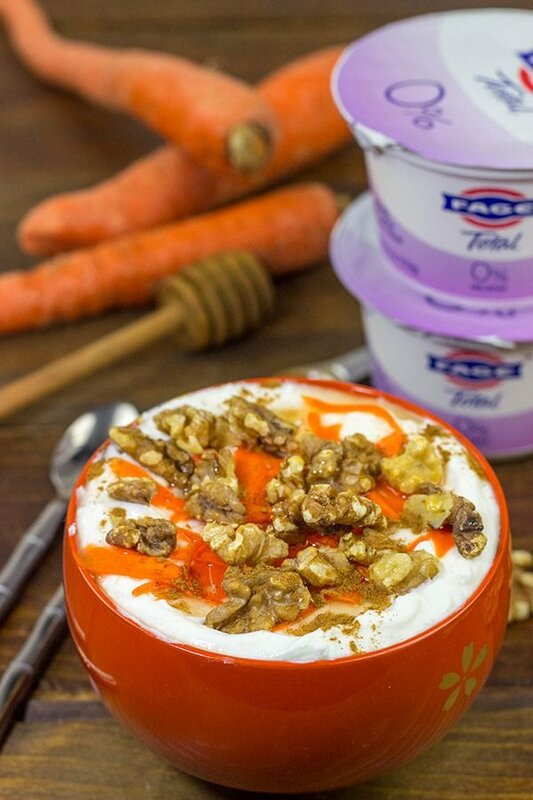 We love topping our Greek Yogurt with Nuts, Honey and Maple Syrup. Mix and match the flavors for fun combinations! We rarely ever eat the same thing for dinner around our house. But breakfast is a different story. We always keep plain Greek yogurt in the fridge, and our weekday breakfasts typically involve yogurt garnished with some sort of fun (but easy!) topping. Sometimes I keep granola in the cupboard, and I’ve had a lot of fun playing with various granola mix-ins. (To date, my favorite is this Maple Pecan version while Laura points to this Chocolate Almond variation.) But when we don’t have granola in the cabinet, we still like to add toasted nuts and a bit of honey or maple syrup. A bowl of plain Greek yogurt is a blank canvas! This Greek Yogurt with Nuts, Honey and Maple Syrup post is a bit different than other posts. Sure, there’s a recipe at the bottom. But the general theme of this post is more about topping ideas for Greek yogurt. Get creative. Have fun! Mix and match the types of nuts. Use a bit of cinnamon, or a dash or nutmeg, or get crazy and toss in a pinch (tiny pinch!) of cayenne. After all, traditional Mexican hot chocolate calls for cayenne and cinnamon…so why not adapt that idea for on top of Greek yogurt? Whatever you do, breakfast (or mid-afternoon snack) shouldn’t be boring! A simple variation of one of my favorite granola flavors, this Maple Pecan version is one of my go-to’s for weekday mornings. 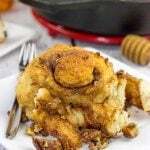 Some toasted pecans mixed with maple syrup and a pinch of cinnamon is all it takes. This flavor combination reminds me of a crisp, Autumn morning! Laura has loved pistachios for as long as I can remember. In fact, when we first met, she’d always keep a bag of pistachios around for snacking. So it should come as no surprise that this Honey Pistachio version is one of Laura’s favorites. Toasted pistachios drizzled with honey make for an easy (but delicious) yogurt topping. 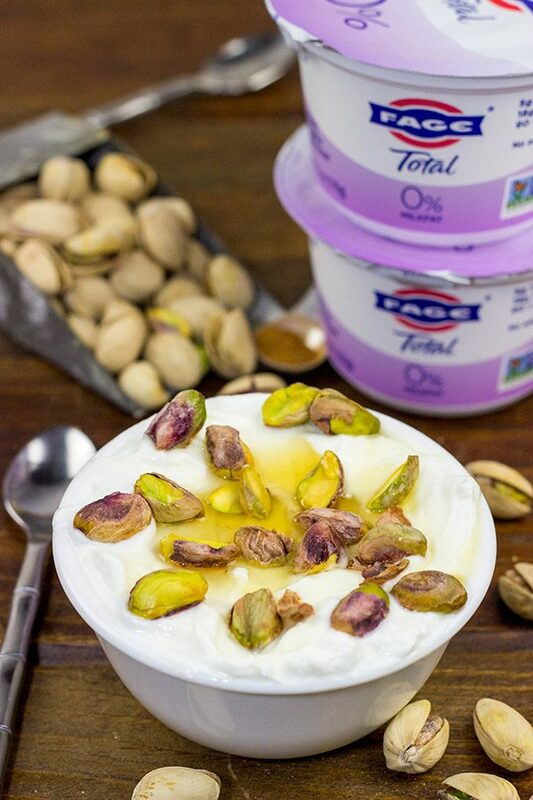 FAGE is an all-natural Greek strained yogurt, so it pairs quite well with the classic Greek flavors of honey and pistachio. Aside from the delicious taste, one of my favorite things about FAGE is its’ rich, creamy texture. I look forward to opening up that container each morning! It’s apple season here in upstate New York. That means we’ve got a seemingly endless supply of apples in our fridge. (I’m not kidding when I say that we pick about 50 pounds of apples each year!) This Apple Almond version is a great way to incorporate a bit of fruit into your yogurt topping. I’ve made this apple topping with both almonds and pecans, but I keep going back to the sliced almonds here. And a sprinkling of brown sugar on top really brings these flavors together! Last (but certainly not least) is this Carrot Walnut version. This came about when we happened to have an extra 3 pounds of carrots in the fridge recently. Yup, it was a carrot catastrophe…or at least a carrot overload. Carrots are naturally sweet, so shredding and stirring ’em into yogurt is actually quite delicious. Add in a bit of honey, cinnamon and toasted walnuts, and the result totally reminds me of carrot cake…just on top of my morning yogurt! 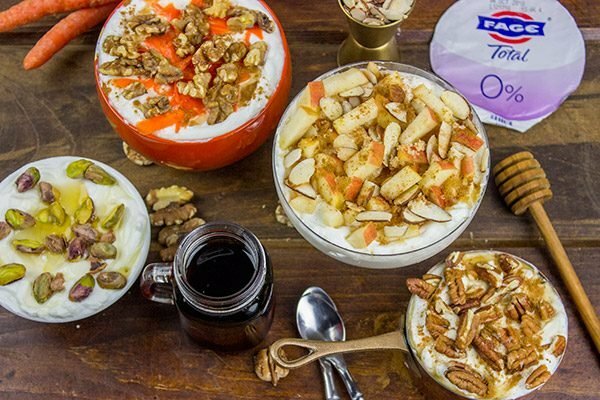 Starting with good quality Greek yogurt like FAGE is our secret to delicious (but easy) morning breakfasts. (Check out FAGE’s store finder to find FAGE Total 0% in a store near you.) After that, it’s up to you to fill in that blank canvas! How do you top your Greek yogurt? Want to take the toppings a step further? 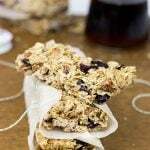 Check out these granola recipes and make a batch for next week’s breakfast! For any of the flavor combinations above, start by toasting the nuts lightly. Place the nuts in a small skillet over medium heat. Cook, shaking occasionally, for 4-5 minutes, or until you can begin to smell the nuts. 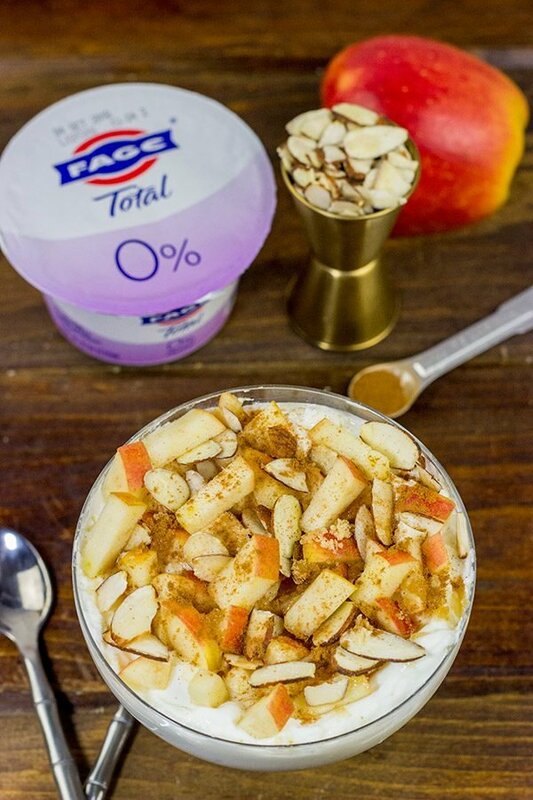 Combine the other ingredients for your flavor combination and serve over FAGE Total 0% Greek Yogurt. I’m reading this post and eating my morning Fage with cinnamon and raisins mixed in. I’m all about the mix-ins! Raisins are my fave, but I’m going to change things up tomorrow; I LOVE the idea of pistachios and honey! Haha! It’s like I’m just reaching out via the blog right to you, Kelsie. And as much as I love the cinnamon + raisin topping (delicious idea! ), I’ve got to say I’m surprised. I always imagined you eating cake for breakfast. (Kidding!) Definitely try the pistachios and honey. That’s a fun way to mix things up for sure! We ALWAYS have yogurt in the fridge and I pretty much eat it every day…usually for a mid morning or afternoon snack and I rarely ever eat it as is….there are always add ins, especially berries and nuts. And if I am enjoying a plain yogurt, maple syrup is lovely. Never thought of shredding carrots in there before – what an awesome idea to get more veg in! Love it! I agree with you there, Dawn! Yogurt by itself is tasty, but maple syrup takes it to a whole new level. That’s one of my favorite flavor add-ins! And the carrots? I kinda stumbled into that idea, but both Laura and I love it…especially as a mid-afternoon snack. Thanks so much, my friend! We also always have Greek and Turkish yogurt in the fridge. No FAGE over here, but that was our brand when we lived in the US. How do we eat our breakfast yogurt over here??? The European way, with muesli. But, your topping recipes look yummy as well. I can’t imagine how hard it must be to move to a new country like that, Ron. Everything that you were used to (including brands of yogurt) has to be adjusted. But then again, I’m a little bit jealous that you live in Europe! 🙂 Muesli, eh? I must admit that I’ve had that for breakfast when on vacation (in Europe), but I’ve never done that here at home. I’m always looking for new ideas, though. Thanks for sharing, my friend! I have never tried yogurt with carrots but I will give it a try . I have been eating more yogurt lately. The carrots are definitely a unique topping, but both Laura and I really liked ’em. I agree that it’s unexpected, but try it out sometime. Thanks so much, Gerlinde! I haven’t made granola in ages David, thanks for the reminder! But yes I totally agree that a bowl of plain Greek yogurt is like a blank canvas. I’m often experimenting with the flavour combination of adding lots of different nuts to Greek yogurt. I love their soft crunchy texture against the cool taste of the Greek yogurt. And as for adding apples, Greek yogurt with some grated apple is delicious! Thanks for this delicious recipe. Homemade granola is one of my favorites, too, Neil! I always try to keep some in the pantry, but when we run out I turn to simple ideas like fruit + nuts. 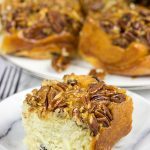 The maple syrup + pecans is one of my favorites! And we currently have about 50 pounds of apples here in the house, so those apples have made their way into yogurt, too. Thanks for the comment! Staple around our house as well, as is FAGE. I’m loving the nuts and honey approach — especially the pistachios, that sounds great. I don’t see the 0% around here very often, usually just the 2% and 5%. Go figure. That’s funny about the 0% versus the 2% and 5%. The 0% is easier for me to find in my stores. Go figure, for sure! Either way, the toppings don’t change. I lean towards the maple syrup and pecans, but Laura loves the honey and pistachios. You can’t go wrong either way! Thanks so much, Bill! You know, we use Greek yogurt for savory recipes quite a bit, too. I love using it in marinades…like for the chicken tikka masala that I just shared. Yum! But it’s also our go-to for easy breakfasts and mid-afternoon snacks. The honey + pistachios is really good. Try that one out sometime! Thanks, Ben! I often eat yogurt bowls too! Lately I’ve been topping them with either banana, cinnamon raisin PB & sprinkled cinnamon, or granola & blueberries. Your combos all look delish! Yogurt bowls are such an easy snack (or breakfast)! Cinnamon raison + peanut butter sounds awesome. I’ll have to try that one soon! Thanks so much, Nicole! Yogurt with granola and fruit is one of my favorite breakfasts. I think I need to change it up a bit with a few of your ideas. The honey and pistachio looks great! Love all of these combinations, David! This is exactly the kind of breakfast I love! Such a great way to start the day! I like the carrot cake version. Yup! The carrot cake version is unique, and really quite tasty, too. I mean it’s Greek yogurt + cake…how can you go wrong there? Thanks, Jeff! Love Greek yogurt – it is so filling & delicious! Seeing it as a blank canvas is the right attitude, there are so many great ways to make it into a delicious treat. Great combinations, David! There really are endless ways to mix up the Greek yogurt toppings, Miriam! I personally go to the maple + pecan options first, but Laura loves the pistachio + honey. Either way, it’s easy and delicious, so count me in! Thanks so much! I don’t know how I missed this post! Gosh, we LOVE Fage too – I currently have 3 containers of different types of Fage in my fridge! 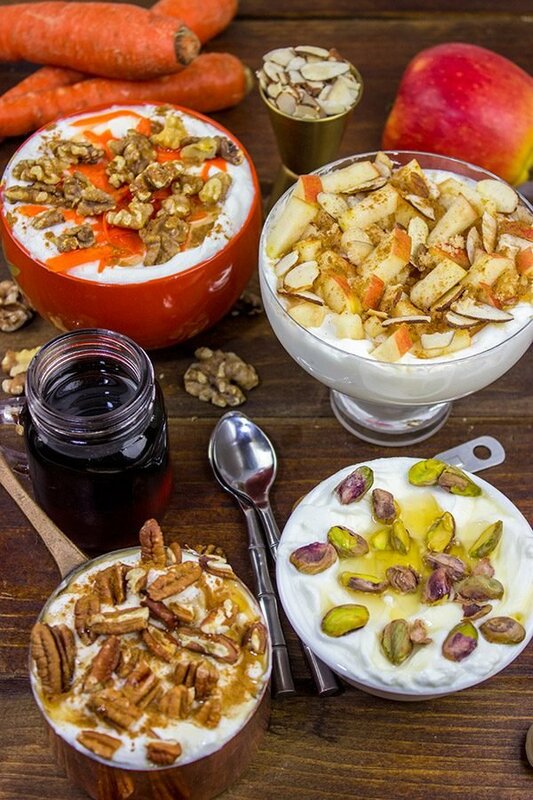 Next time its my turn to do breakfast for a group am so gonna do a yogurt bar and have these nut-infused yogurts as an option too. Personally, I love the combo of crunchy nuts, creamy yogurt and sweet honey – such a treat! I remember your FAGE post, and you’ve inspired me to try some of the other types. We love the 0%! A yogurt bar would be a great idea for a morning meeting or breakfast for a group. And, yes, I’m the same way with textures. The yogurt is super creamy, so it’s nice to have crunchy in there too! Thanks so much, Shashi!